A full tribute to the CWS Primetime Performers follows below, featuring headshots and action photos – along with expanded bio./accomplishment capsules – for each of the 14 players. Leading the way are TCU senior catcher Bryan Holaday (Dallas, Texas) and South Carolina sophomore lefthander Michael Roth (Greer, S.C.), the respective Primetime Player and Primetime Pitcher of the 2010 College World Series (as selected by CollegeCaseball360.com). CLICK HERE for the CB360 Primetime Performer archive. Roth is joined by four other South Carolina players on CB360’s 2010 CWS Primetime Performers Honor Roll: senior RHP Blake Cooper (Neeses, S.C.), sophomore centerfielder Jackie Bradley, Jr. (Prince George, Va.), freshman first baseman Christian Walker (Limerick, Pa.) and fr./so. 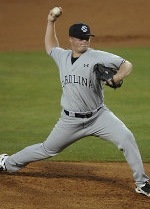 RH closer Matt Price (Sumter, S.C.). Holaday was one of three TCU players named to the Primetime team, along with sophomore shortstop Taylor Featherston (Katy, Texas) and freshman LHP Matt Purke (Spring, Texas). The CWS Primetime honorees include five starting pitchers (RHPs Cooper, Bauer and Neal; LHPs Roth and Purke), three centefielders (Bradley, Amaral and Holt) and a pair of catchers (Holaday and Ogle), plus the first baseman Walker, shortstop Featherson, third baseman Hinson and closer Price. The 14 selections feature the battle-tested seniors Holaday and Cooper, three juniors (Hinson, Holt & Neal), a group of six sophomore that includes several likely high draft picks in 2010 (Bradley, Bauer, Featherston, Ogle, Price and Roth), and the promising freshman trio of Amaral, Purke & Walker. The honorees hail from seven different home states, led by five from Texas (the TCU and Oklahoma players) and three of the South Carolina players who are native sons (Cooper, Price & Roth), plus the UCLA duo (both in-state California products) and one each from Florida (Holt), North Carolina (Hinson), Pennsylvania (Walker) and Virginia (Bradley). 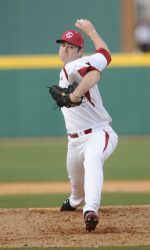 … ROTH rose to the occasion during four appearances at the 2010 College World Series, where he compiled a 1.10 ERA and answered the call with strong outings in his first two starts of the season (he also made only two starts as a freshman, in 2009). His most impressive appearance came in his first start, as the 6-1, 210-pound lefthander went the distance in 3-hit fashion to defeat in-state rival Clemson (5-1) – in what was SC’s third of four straight wins when facing elimination. Over the course of his 16.1 innings at the CWS, Roth limited the opposition to a .167 combined batting avg. (9 H) and had three times as many strikeouts (9) as walks (3, also 3 hit batters and 20 groundouts). During his four appearances, Roth allowed 4-of-16 leadoff batters to reach base – but the opposition hit only 3-for-20 (.150) vs. him with runners on base and Roth closed out innings with near-perfect efficiency (limiting opponents to 1-for-17 hitting/.059 with 2-outs). Roth’s first appearance came in relief of Blake Cooper, retiring 4-of-5 batters he faced (HBP, K) in the 6th/7th to maintain a 3-2 deficit vs. Oklahoma (SC rallied but still lost its opener, 4-3). Four days later, the scenario repeated itself – as Roth again relieved Cooper (with another narrow deficit vs. OU, 1-0) and retired all 4 he faced (K) – but this time the Gamecocks completed their rally for a 3-2, 12-inning win. Less than 24 hours later, Roth was back on the mound as a surprise starter vs. rested in-state rival Clemson. His complete-game masterpiece in that 5-1 win saw virtually all of Clemson’s 33 batters fail to drive the ball out of the infield. Roth allowed only thee runners into scoring position (one reached third base), with his 9.0 innings featuring a 2nd-inning double/run scored, singles in the 8th and 9th, 16 groundball outs, 4 Ks, 2 foulouts, an infield lineout double play (4-3) and 3 flyouts (also a walk, 2 hit batters and a runner who reached on an E4 throw). Richie Shaffer’s 3rd-inning leadoff double represented the only ball vs. Roth that reached the outfield until Spencer Kieboom’s flyout to right ended the 5th. Roth located 67 of his 108 pitches for strikes and did not allow a hit from Clemson’s #1 thru #4 spots in the batting order (0-for-14, BB, HBP, K … Chris Epps/John Nester, Mike Freeman, Jess Schaus and Kyle Parker). Clemson twice put the leadoff man on vs. Roth, who proved extra-tough with runners on base (1-for-10 opp. batting) and with 2-outs (1-for-9). Roth’s strong start vs. UCLA in the title-clinching win set up the 2-1 final score, with the decisive run coming in the bottom of the 11th. His 5.0 innings included the lone run scored on 6 hits and 2 walks, with 3 strikeouts. The Bruins failed to generate a 2-out hit vs. Roth (0-for-5), who avoided the big inning and laid the groundwork for the rare 1-1 game through 9-plus innings. Roth finished the season with a team-best 1.34 ERA and 3.5 K-to-walk ratio (35/10) spanning 37 appearances and 40.1 innings (27 hits allowed, .196 opp. avg.). HOLADAY reached base multiple times in each of TCU’s five games in Omaha and hit more home runs (4) than any other player in the 2010 CWS (no other players had more than 2 HR). He joined SC’s Walker (.414) as the only players with 17-plus ABs who hit above .400 in the CWS (.409; 9-for-22), with his other stats including 5 RBI, a CWS-leading 8 runs scored, a double (part of his 1.000 slugging pct.) and a walk. His 1.458 OPS (.458 on-base) ranked second only to Ogle’s 1.624, among the players in the eight-team CWS field. Situationally, the 5-11, 190-pound righthanded-hitting Holaday batted equally well against lefthanded (3-for-8/.375) and RH pitching (6-for-14/.429) and went 3-for-4 (3 RBI) with 2-outs on the board (also 3-for-9 w/ runners on). Beyond his offensive numbers, Holday continued to direct the talented TCU pitching staff and made an ever bigger impression on observers due to his leadership and inspiring play. 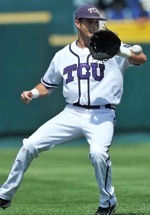 Several opposing coaches at the CWS singled out Holaday for his all-around contributions to TCU’s success. Holaday had a big debut in the CWS opener vs. Florida State (8-1 win), batting 3-for-5 from his customary 2-hole spot (a rare lineup position for a catcher on any level). 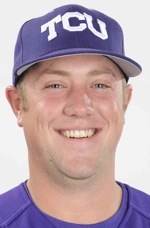 His single and run scored helped the Frogs jump out to a 5-0 lead in the 1st inning, and he added another single in the 2nd before sending his 14th home run of the season over the leftfield fence (for a 7-1 cushion in the 4th). Two days later, vs. UCLA ace Gerrit Cole, Holaday reached base twice (HBP, BB) but the TCU offense failed to generate enough runs (in a 6-3 loss). Holaday then helped his team rally to avoid elimination, in an 11-7 comeback vs. Florida State. The veteran catcher scored a run in the 3rd and had a 5th-inning single, before playing his part in the 8th-inning eruption that saw TCU turn a 4-run deficit into a 4-run lead. With one run on the board in the top of the 8th and TCU still trailing (7-4), Holaday stepped in with 2-outs and FSU relief ace Mike McGee on the mound. He took the first pitch for a ball before connecting on an RBI double to left field. Two batters later, Matt Curry’s grand slam vaulted TCU into the lead – but Holaday’s clutch 2-out double had helped set the table for that huge home run. Two days later, Holaday’s 1st-inning single and run scored helped put TCU on its way to avenging the earlier loss to UCLA (6-2). He added a home run in the 8th for the final cushion – and homered twice twice more (once to left-center, once dead-center) in the third game vs. the Bruins, a 10-3 loss. The recipient of the Johnny Bench Award – recognizing college baseball’s top all-around catcher in 2010 – Holaday finished the season with a .355 batting avg., 53 RBI, a team-best 72 runs scored, 42 extra-base hits (17 HR, 3B, 24 2B), 42 free passes (29 BB, 13 HBP) and a gaudy 1.069 OPS (.438 on-base plus .631 slugging). • Involved in clutch performances, such as late game-winning hits, noteworthy comebacks, game-changing plays, etc. Top of the lineup batter (leadoff/2-hole) who hit team-best .375 (9-for-24) during six CWS games (with 2 RBI, 4 runs, 3 doubles, 2 walks, 2 HBP and a stolen base) … compiled a .964 OPS (.464 on-base, .500 slugging pct.) 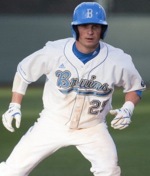 during his stay in Omaha (he was the only player to hit more than 2 doubles) … picked up the slack for UCLA offense that averaged only 5.2 runs per game in Omaha (the rest of the team hit .257 at the CWS) … hit for the same avg. (.375) vs. LH and RH pitchers, also batting .417 (5-12) with runners aboard during the CWS … proved to be an effective table-setter , reaching on 4-of-7 leadoff plate appearances … reached on his first five trips to the plate (3-for-4, BB, HBP, RBI, R, SB) during 11-3 opening win over Florida (#6 seed over #3) … got aboard on 1st-inning HBP during that game, followed by a single/SB/R in the 3rd, a walk in the 4th and two more singles (in the 5th and 7th) … led from the leadoff spot in key 6-3 winners-bracket win over TCU (3-for-3, BB, RBI, 2R) … walked and scored in the 1st inning of that game, followed by singles in the 2nd and 4th and a 7th-inning double down the leftfield line that led to him scoring team’s final run … joined his teammates in suffering through 4-hit loss vs. TCU four days later, but he and the Bruins bounced back to beat the Frogs again (10-3) for a spot in the championship series … UCKA endured 4-hit loss vs. South Carolina in title-series opener (7-1) before more competitive second game (2-1 decisive loss, in 11 inn.) … had a single and double in that final game, but was stranded each time … earned second team all-Pac-10 honors in 2010, en route to team-best .354 season batting avg. (31 RBI, 45 R, 4 HR, 12 2B, 20 BB, 16 HBP, .442 on-base, 9 SB). Struck out 24 batters spanning 15 innings pitched in Omaha (14.4 Ks/9 IP), with only 4 walks in his pair of outings (6:1 K-to-walk ratio) … allowed 6 runs (5 earned; 3.00 ERA) en route to picking up key wins over Florida (11-3) and TCU (10-3; bracket final) … limited opposing hitters to a .182 combined batting avg. (10 H), with his other CWS stats including a pair of wild pitches and 2 balks … proved equally tough vs. righthanded (.188 batting avg.) and lefthanded hitters (.174) … allowed only 3 hits with men on base (.176) and surrendered only 4 two-out hits (.200) … struck out 11 (4 “looking) in the opening win over Florida, with 3 runs, 6 hits and a pair of walks allowed in that 7-inning outing (2 BK) … 17 of his 21 outs vs. the Gators came via Ks or groundouts (6) … proved tough to hit for the UF righthanded hitters (2-for-12; also 2-for-12 w/runners on and 2-for-10 with 2-outs) … his elimination-game win over TCU included 8.0 strong innings (30 batters faced), with more than half of his strikeouts (7 of 13) coming on called strike-3s … limited Horned Frogs to 3 runs (2 earned) on 4 hits and pair of walks (2 WP) … allowed leadoff baserunner only twice in the TCU game (also did not allow a lefthanded hit, 0-for-7, while limiting Frogs to 1-for-5 batting with runners on and 2-for-20 w/ 2-outs) … struck out the final four TCU batters he faced, en route to his 8th double-digit K game of the season … became first UCLA pitcher ever to post three wins in one NCAA Tournament … ended his All-America 2010 season with UCLA-record and nation-leading 165 strikeouts (in 131.1 innings; 11.3 Ks per 9 IP), plus a 3.02 season ERA, 12-3 record, 41 walks (4-to-1 K/walk ratio) and a .244 opponent batting avg. 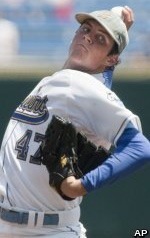 … first UCLA pitcher with 12-plus wins since 1997 (when future big-leaguer Jim Parque won 13). Talented all-around player and 3-hole hitter who stormed out of the gate at the CWS, batting 5-for-8 with 7 RBI and a pair of home runs in the first two games … ended up leading all players at the 2010 CWS with 9 RBI, while batting .345 (10-for-29) with 5 runs scored and a 1.027 OPS (.441 on-base plus .586 slugging pct. ; 3BB, 2HBP, 2HR, 2B) …hit 4-for-10 in Omaha with runners in scoring position (also 4-for-10/3 RBI with 2-outs) … kept Gamecocks in the game during opening 4-3 loss to Okahoma (2-for-4, 2RBI-HR-BB) … sent ball over rightfield fence to forge 4th-inning tie in that first game vs. OU (2-2) … also had 1st-inning single and 2-out walk in the 9th, as SC rallied to nearly tie the game (1R in 9th, left bases loaded) … drove in 4 runs to help eliminate top seed Arizona State, 11-4 (3-for-4, HR, HBP) … had 1st-inning single in that game, then launched huge 3-run HR to left-center as part of crushing 8-run bottom of the 2nd (also had bases-loaded HBP in the 3rd and singled in the 9th) … his only hit in elimination game vs. Oklahoma was a big one: a 2-out single to right that tied the game in the 12th (he scored moments later on a Brady Thomas single, for 3-2 win) … stroked a 3rd-inning RBI double the next day, for early 3-0 lead vs. in-state rival Clemson (5-1 win; also walked in 8th) … had early single and a HBP in bracket final rematch vs. the Tigers, later earning an intentional walk and coming around to score 7th-inning run that secured final margin in that 4-3 game … opened the title series vs. UCLA with a 2-out bunt single and run scored, adding another infield single in that 7-1 win … helped clinch title in 2-1, 11-inning thriller vs. UCLA … a second team all-SEC performer in 2010, with his final stats including team-best totals in batting avg. (.368) and RBI (60), plus 56 runs scored, 26 extra-base hits (13 HR, 3B, 12 2B), four more walks than strikeouts (41/37, plus 8 HBP), an impressive 1.060 OPS (.473 on-base plus .587 slugging pct. ), 7 stolen bases and a .933 fielding pct. (1 error). Battle-tested veteran who made three starts at the CWS, logging 300 total pitches and a 2.41 ERA while going 1-1 with 21 strikeouts, only 5 walks, 3 hit batters and 13 hits allowed (.197 opp. batting avg.) in 18.2 innings … proved tough against lefthanded batters (1-for-6) … allowed 8-of-20 leadoff batters to reach, but limited the opposition to .179 batting with runners on base (12-for-60) and .150 w/ 2-outs (3-for-20) … had a solid outing but limited run support in CWS opener vs. Oklahoma (4-3), taking the loss after 5 IP (3R-6H-BB-5K-22BF-67 pitches) … returned to the mound four days later for strong start in 12-inning elimination-game rematch vs. OU (3-2 win) … allowed a single run over 5.2 innings during that clutch outing (4H-2BB-HB-6K-22BF-98p), limiting OU to 1-for-7 batting with runners on (0-for-4 w/ 2-outs) … was back on the mound four days later, picking up huge 7-1 win vs. UCLA in title series opener (8+IP-R-3H-BB-10K-10 groundouts-32BF-136p) for his 34th career victory with the Gamecocks … took a no-hitter into 5th inning of that game and carried a 1-hitter into the 8th … allowed a ball out of the infield only three times through the first 8.0 innings (2 flyouts; his 24 outs included the 10 Ks, 10 GOs, a foulout to the 2B and a lineout back to the mound) … limited UCLA leadoff batters to reaching only twice (plus 1-for-11 with runners on, 0-for-8 w/ 2-outs) … a first team all-SEC selection in 2010, when he finished the season with a 2.76 ERA, 13-2 record and 3.2 K-to-walk ratio (126/39) in 137 innings (111 H, .223 opp. avg., 15 HB, only 1 wild pitch). Slick-fielding shortstop who played error-free in four CWS games (19 fielding chances; three double-plays) while providing a huge offensive boost from the 7-hole … racked up a 1.183 OPS (.450 on-base plus .733 slugging pct.) 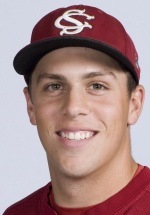 in Omaha, after batting 6-for-15 (.333) with 12 total bases (HR-3B-2B) and 4 walks (also a sac.-fly) … his .733 slugging was 4th-best among all players at the 2010 CWS … joined South Carolina RF/3B Whit Merrifield as only players that hit for the cycle over the course of their respective CWS games (not in one game) … finished second at the CWS with 7 RBI (behind SC’s Jackie Bradley, Jr., who drove in 9 runs) … 4 of his RBI came with 2-outs (also hit 3-for-5 w/ runners in scoring position) … had early sac.-fly and nearly scored in the 3rd inning (BB/reached 3rd) to help beat Florida State in 8-1 CWS opener … delivered one of the most exciting moments of the 2010 CWS two days later, when his 2-out, bases-clearing triple cut UCLA’s lead in half (6-3) with two full innings still to play (the Bruins held on to that final margin) … his single was part of TCU’s thrilling 8-run top of the 8th, as the Frogs rallied to beat FSU again (11-7, this time in an elimination game) … two days later, he reached base in all four of his plate appearances (2-for-2, 2 BB, 3 RBI) to help beat UCLA, 6-2 … walked with the bases-loaded in that game, then singled and stole a base, walked again and launched 2-run HR over leftfield fence to turn a 3-2 game into a 5-2 cushion heading into the 8th … closed with a double and walk in decisive third game vs. UCLA (10-3 loss) … a first team all-Mountain West Conference selection (also MVP of the NCAA Ft. Worth Regional), he hit .338 during the 2010 season, with 52 RBI, 59 runs scored and an impressive extra-base combination (16 2B, 7 3B, 8 HR), plus 23 walks and a .991 OPS (.420 OB, .571 slug.). Six-hole batter who led Clemson to a 2-0 start at the CWS and ended up hitting team-best .438 (7-for-16) during four games in Omaha (3B, BB, 2 SB; no errors at the hot corner) … his .438 batting was best at the CWS among players with 12-plus at-bats … factored into nearly one-third of his team’s 16 runs (3 RBI, 3 R) in Omaha … hit 3-for-5 with runners in scoring position and reached 2-of-4 times as leadoff batter … helped knock off top-seeded Arizona State (6-3), with an RBI single and run scored to cap a 3-run top of the 5th (also singled in the 7th) … returned to Rosenblatt two days later and was the offensive hero in 6-4 winners-bracket win over Oklahoma (3-for-4, 2 RBI, R, 2 SB) … sent 4th-inning RBI single to center field, stole second and scored, for 4-1 midgame lead on the Sooners (added RBI single in the 5th) … part of Tigers team that totaled only 3 hits in 5-1 loss vs. in-state rival South Carolina, followed by 2-for-5 effort (5th-inning RBI single/run) in elimination-game rematch vs the Gamecocks (6-3 loss) … finished second on the 2010 Tigers in season batting avg. (.351), RBI (75) and home runs (17), adding a team-best 25 stolen bases, plus 60 runs scored, 9 doubles, a triple, 26 walks and a 1.008 OPS (.410 on-base; .598 slugging). Reached base multiple times in each of TCU’s five games in Omaha and hit more home runs (4) than any other player in the 2010 CWS (no other players had more than 2 HR) … one of two players with 17-plus ABs who hit above .400 in the CWS (.409; 9-for-22), adding 5 RBI, a CWS-leading 8 runs scored, a double (part of his 1.000 slugging pct.) and a walk .. his 1.458 OPS (.458 on-base) ranked second at the CWS … batted equally well against lefthanded (3-for-8/.375) and RH pitching (6-for-14/.429) and went 3-for-4 (3 RBI) with 2-outs (3-for-9 w/ runners on) … continued to direct talented pitching staff and made an ever bigger impression on observers due to his leadership and inspiring play … had big debut in CWS opener vs. Florida State (8-1 win), batting 3-for-5 from his customary 2-hole spot (a rare lineup position for a catcher on any level) … his single and run scored helped Frogs jump out to a 5-0 lead in the 1st inning, and he added another single in the 2nd before sending ball over leftfield fence for 7-1 cushion in the 4th … two days later, vs. UCLA ace Gerrit Cole, he reached base twice (HBP, BB) but the TCU offense failed to generate enough runs in 6-3 loss) … helped his team rally to avoid elimination, in 11-7 comeback vs. FSU … scored in the 3rd and had a 5th-inning single, before playing his part in 8th-inning eruption that saw TCU turn a 4-run deficit into a 4-run lead … with one run on the board in the top of the 8th and TCU still trailing (7-4), he stepped in with 2-outs to face FSU relief ace Mike McGee, connecting on a 0-1 pitch for an RBI double to left field (minutes before Matt Curry’s grand slam) … two days later, his 1st-inning single and run scored helped put TCU on its way to avenging earlier loss to UCLA (6-2) … added a home run in the 8th for final cushion – and homered twice twice more (once to left-center, once dead-center) in third game vs. the Bruins, a 10-3 loss … recipient of the Johnny Bench Award, recognizing college baseball’s top all-around catcher in 2010 … finished season with .355 batting avg., 53 RBI, team-best 72 runs scored, 42 extra-base hits (17 HR, 3B, 24 2B), 42 free passes (29 BB, 13 HBP) and a gaudy 1.069 OPS (.438 on-base, .631 slug.). Leadoff batter who hit .417 at the CWS (5-for-14), with a .533 on-base pct. (3 walks), 4 runs scored, 2 RBI, a home run and only a single strikeout … his .417 batting was 2nd-best at the CWS among players with 12-plus ABs … compiled the 4th-best OPS (1.200; .533 on-base plus .667 slugging pct.) 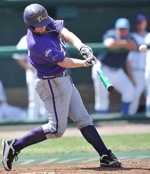 among players at the 2010 CWS … reached base 3-of-5 times when leading off the inning … singled vs. TCU ace Matt Purke and scored to open the scoring at the 2010 CWS (also walked in next trip to the plate; 8-1 loss) … reached base four times (3-for-4, BB) to lead 8-5 elimination-game victory over in-state rival Florida (2 RBI-3R-HR) … led off the bottom of the 1st in that game with a home run to center field (vs. Hudson Randall), later adding a walk/run (sparking 3-run bottom of 3rd), a single up the middle/run and an RBI single into the right-center gap … singled and scored in the 5th for 5-2 lead in elimination-game rematch vs. TCU (later drew 8th-inning walk to load the bases, but TCU escaped en route to closing out a thrilling 11-7 comeback win) … his 2010 All-America season included an impressive all-around collection of statistical accomplishments, with a team-best .355 batting avg., 87 runs scored, 48 RBI and 30 stolen bases on 33 attempts, plus 13 home runs among his 42 extra-base hits (26 2B, 3 3B), 11 more walks than strikeouts (59/48, plus 4 HBPs), a 1.100 OPS (.471 on-base; .629 slug.) and a .994 fielding pct. (only 1 E). Likely would have picked up elimination-game win versus eventual NCAA champion South Carolina, but he received only one supporting run from the OU offense as Sooners lost, 3-2 in 12 innings … logged 7.0 shutout innings before allowing leadoff hit in the 8th (his final batter faced, with the runner coming around to tie the score) … retired 14 straight at one point and faced only 28 batters, with 5 hits allowed, a walk, hit batter and 7 strikeouts … limited the SC lefthanded hitters to 1-for-8 combined hitting and allowed only a pair of 2-out hits (2-for-9) … the 104-pitch outing (62 strikes) easily ranked as one of his best of the season (4.23 final ERA), matching his fewest earned runs allowed in 18 starts during the 2010 season … earlier had an 8-inning no-decision in the NCAA Regional round vs. North Carolina (3R-8H-3BB-10K; OU won 7-6 in 10) … earned 2010 second team all-Big 12 honors, with his other season stats including an 8-3 record, nearly a 4-to-1 K/walk ratio (95/24, in 105.2 innings) and a .275 oppnent batting avg. Cleanup hitter whose .455 batting (5-for-11) at the CWS picked up the slack for an OU offense that hit only .196 during its three games in Omaha (rest of team was .165) … factored into half of team’s 10 runs at the CWS (4 RBI-3R-2HR) while compiling a CWS-best 1.629 OPS (.538 on-base plus a CWS-leading 1.091 slugging pct. ; 2B, 2 BB, sac-bunt) with no strikeouts … hit 2-for-3 with runners in scoring position and 2-for-4 with 2-outs (reached as leadoff batter 3-of-5 times) … brought home the game’s first run with 2-out single in the 1st, as OU beat eventual NCAA champ South Carolina (4-3) … two days later, he had a walk, 8th-inning home run and RBI double in the 9th but the Sooners lost to Clemson in the winners-bracket (6-4) … nearly carried OU to elimination-game win vs. SC (3-2 loss, in 12 inn.) … led off 2nd inning of that game with single and run scored, adding sac. bunt and a walk as Sooners endured nine scoreless innings … was in line to be the 12th-inning hero, when his home run cleared the centerfield fence to lead off the top of the inning (1-0 pitch from Ethan Carter; SC scored twice in bottom of 12th) … his 2010 final statistics included a .331 batting avg. (2nd-best among the OU regulars), plus 46 RBI, 39 runs, 11 home runs, 11 doubles, an equal number of walks vs. strikeouts (26; plus 4 HBP) and a 1.040 OPS (.439 on-base; .601 slug.). Closer for national champs who compiled a 0.93 ERA spanning four CWS appearances … his two wins included decisive game that won national title (2-1, in 11 inn.) …. allowed a single run in his 9.2 innings while racking up 15 Ks to only a single walk … held opposing hitters to a .189 combined batting avg. (7-for-27) and had a “WHIP” (walks + hits per 9 IP) of 7.72 … a triple was his only extra-base hit allowed (also had three HBPs and faced 41 total batters) … allowed a couple inherited runners to score but still closed out the huge win that eliminated #1 seed Arizona State, 11-4 (1.2 IP, 3 H, 4 K, HB, 9 BF) … returned to the mound two days later for an impressive performance in another elimination game (3-2 vs. Oklahoma, in 12 inn.) … faced only 10 batters while pitching the 9th-11th innings of that thriller (HB, 5 Ks) … was the pitcher of record in 4-3 win over in-state rival Clemson, sending Gamecocks on to the title series (1.2IP-R-3H-3K-10BF) … closed title-clinching win vs. UCLA, with 2.2 shutout innings (H-BB-HB-3K-12 BF) … a second team all-SEC selection, he finished the 2010 season with a 2.26 ERA, 10 saves and a 4-1 record in 31 relief appearances, along with a 4.4 K-to-walk ratio (83/19), a lowly .183 opp. batting avg., an impressive 9.05 “WHIP” (37 H; had 19 more innings pitched than hits allowed), 9 hit batters and no wild pitches. Rookie sensation and 2009 MLB Draft 1st-rounder who lived up to his billing while pitching on the big stage at the CWS, where he won both of his starts en route to compiling a 1.35 ERA over 13.1 innings (9 Ks, 6 BB, HB, WP, 7 H, .152 opp. batting avg.) … allowed only a pair of hits from lefthanded batters (2-for-17; .118) during the wins over Florida State (8-1) and UCLA (6-2) … surrendered a leadoff baserunner four times in Omaha, but opposing hitters were only 3-for-18 with runners on base (.168) and 1-for-13 with 2-outs (.077) … 35 of his 40 outs at the CWS came via strikeouts or groundball outs (26) … was touched for only one run (unearned) in his CWS debut vs. FSU (7IP-7K-4BB-4H-11GO-28BF-115 pitches) … held the Seminoles’ lefthanded bats to 1-for-8 while working out of several jams (FSU was 2-for-13 w/ runners on and 0-for-6 w/ 2-outs) … returned six days later to help beat UCLA and stave off elimination, with 14 groundouts in that 6.1-inning appearance (2R-3H-2K-2BB-HB-25BF-107 p) … allowed only 1-of-7 Bruins leadoff batters to reach (1-for-5 UCLA batting w/ runners on, 1-for-7 w/ 2-outs, 1-for-9 by lefties) … ended his All-America season as national leader in wins (16-0; 20 appearances/18 starts), along with a 3.02 ERA, a 4.2 K-to-walk ratio (142/34 in 116.1 innings; 11.0 Ks per 9 IP), and 25 more innings pitched (116.1) than hits allowed (91; .212 opp. batting avg.). Rose to the occasion during four appearances at the CWS, where he compiled a 1.10 ERA and answered the call with strong outings in his first two starts of season (also made only two starts in ’09) … limited CWS opposition to .167 batting avg. (9 H) and had three times as many strikeouts (9) as walks (3, also 3 HB & 20 groundouts) … allowed 4-of-16 leadoff batters to reach, but the opposition hit only 3-for-20 (.150) with runners on base and 1-for-17 hitting (.059) w/ 2-outs … his first appearance came in relief of Blake Cooper, retiring 4-of-5 batters (HBP, K) in the 6th/7th to maintain 3-2 deficit vs. Oklahoma (4-3 loss) … four days later, the scenario repeated itself – as he again relieved Cooper (with another narrow deficit vs. OU, 1-0) and retired all four he faced (K) as SC went on to win 3-2 in 12 … was back on the mound less than 24 hours later, as surprise starter vs. rested in-state rival Clemson … his 3-hit masterpiece in that 5-1 win saw virtually all of Clemson’s 33 batters fail to drive the ball out of the infield … allowed only three runners into scoring position (one reached third), with his 9.0 innings featuring a 2nd-inning double/run scored, singles in the 8th and 9th, 16 groundball outs, 4 Ks, 2 foulouts, an infield lineout double play (4-3) and 3 flyouts (BB, 2 HB, E4 throw) … located 67 of 108 pitches for strikes and did not yield a hit from Clemson’s #1 thru #4 batters (0-for-14) … allowed Clemson leadoff batters on-base twice and proved extra-tough with runners on (1-for-10 opp. batting) and 2-outs (1-for-9) … his strong start vs. UCLA in title-clinching win set up 2-1 final score (11 inn.) … his 5.0 innings included the lone run scored on 6 H and 2 BB (3 Ks) … the Bruins failed to generate a 2-out hit vs. him (0-for-5) … finished season with team-best 1.34 ERA in 37 appearances (2-1, 3 saves, 35K/10 BB, 27H/.196 opp avg., 40.1 IP). Cleanup hitter who led the national champions with a .414 battting avg. (12-for-29) during the CWS, with the 12 hits representing the most of any player (also had top CWS batting avg. among players with more than 16 ABs) … homered twice at CWS, with 5 RBI, 3 runs scored, a 1.090 OPS (.469 on-base plus .621 slugging pct. ), 3 walks and struck out only once … had solid game (2-for-3, HR, BB) in 4-3 opening loss vs. Oklahoma, with game-tying blast in the 2nd (1-1), a single in the 4th and walk in the 8th … drew a walk in 11-7 win that eliminated top-seeded Arizona State, followed by big game in another elimination game (3-2 vs. OU in 12 inn. ; 3-for-5, RBI, BB) … reached base in his final four plate appearances during that thriller, with singles in the 6th, 8th (tying hit to left scored Evan Marzilli) and 11th – plus 2-out walk in the 12th that advanced the eventual winning run (Jackie Bradley, Jr.) … had a single but was stranded in 5-1 win over Clemson before playing key role in 4-3 rematch vs. the rival Tigers (sending SC to title series) … led off 4th inning of that game with home run to left (2-1 lead) and later supplied clutch 2-out single to center, forging 3-3 tie in the 7th … his 2-for-5 effort in 7-1 win over UCLA included 2-out single/run scored in the 1st (for quick 2-0 lead) … reached base three times in title-clinching win vs. Bruins (2-1, in 11), with 2nd-inning walk and singles in the 5th and 7th … earned spot on the SEC All-Freshman Team, with his final 2010 stats including a .327 batting avg., 51 RBI, 35 runs, 23 extra-base hits (9 HR, 2 3B, 12 2B), an equal number of walks and strikeouts (18, plus 4 HBP) and a .902 OPS (.384 OB, .518 slug.). * – Holaday has been honored by CB360 as the CWS Primetime Player while Roth is the Primetime Pitcher for the 2010 CWS.